Customer satisfaction is a priority at Sherwin-Williams. We go the extra mile offering expert advice, exceptional products and colors to help ensure your project is a success. Thank you for rating Sherwin-Williams "Highest in Customer Satisfaction among Interior Paints¹" by J.D. Power. We can't thank you enough for helping us achieve this honor. Your neighborhood Sherwin-Williams paint store is ready to help with all your painting needs. With over 4,000 stores (plus 2,500 sales representatives), there is a store near you. When you want to make the most of your color with the very best paint... Ask Sherwin-Williams. 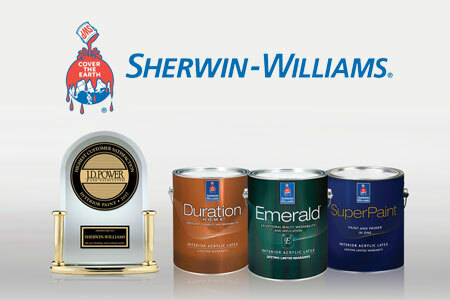 Sherwin-Williams received the highest numerical score among interior paints in the J.D. Power 2017 Paint Satisfaction Study, based on 4,625 total responses from 12 companies measuring experiences and perceptions of customers, surveyed February-March 2017. Your experiences may vary.